There were 624 press releases posted in the last 24 hours and 153,551 in the last 365 days. Practicing for her upcoming Iron Man Triathlon, Maria Korcsmaros was attacked by a Great White Shark at Corona Del Mar swim line on May 29th, 2016. IRVINE, CALIFORNIA, UNITED STATES, October 5, 2018 /EINPresswire.com/ -- Practicing for her upcoming Iron Man Triathlon, Maria Korcsmaros was attacked by a Great White Shark at Corona Del Mar swim line on May 29th, 2016. Two years later, she has become a huge advocate for shark conservation and ocean protection. Maria has dedicated herself to learning as much as she can about the bio-diversity of the ocean, sharks and marine life with the help of Shark Steward's founder, David McGuire. David has helped develop policies pertaining to cage diving with sharks around the world. He is also active against the Shark Fin Trade, which randomly kills sharks for their fins and leaving them to die. Maria has organized an event to raise awareness of the threats to our oceans, pollution concerns, loss of habitats, reefs, sharks, and all marine creatures. She has been consulting with others, such as Ian Cairns, to help humans and marine life coexist together. The event Run 4 Sharks & Ocean Protection is a 1 mile run at 9:15 AM for $20 or the 5K run at 9:00 AM for $30. The event is held in Newport Beach, CA on November 18, 2018. Make sure to register early to get these prices. Deadline for these discounted prices ends November 4, 2018, at 12:01 AM PT. 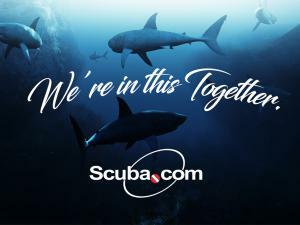 Scuba.com is proud to sponsor Run 4 Sharks & Ocean Protection. Come to our table at the finish line for some goodies! If you are interested in learning to scuba dive, check out our scuba courses at http://scuba.com/class. We have experienced Instructors that will guide you along your amazing journey on becoming a scuba diver and help with any scuba gear questions. Come experience the other 70% and fall in love with our beautiful oceans.